Want to do more than sign online petitions to fight racist mass incarcerations and deportations, but can’t go to weeknight meetings or long marches? That’s why Hillary and Laura—both busy working moms—started a new Immigration Committee project, Let Our People Go. It’s a one-hour protest on second Sundays at ICE’s Northern California headquarters in Richmond. Inspired by Interfaith Movement for Human Integrity’s longtime actions on first Saturdays, Let Our People Go is a family-friendly protest of racist immigration policies. We’re looking for volunteers to help with tasks small and big. At the first Let Our People Go in April, a community member bravely stepped forward to share the story of her husband, who’d been interned by ICE for two years without a hearing or medical attention. Horrified by her story, we connected her to the Kehilla Immigration Committee chairs, IM4HI and other community activists, who moved quickly to raise funds for her husband’s defense, find him a new lawyer, publicize his plight, and support the family to fight eviction. As a result, he was freed on bond in July, though he continues to fight his deportation case. Experiences like this bolster our resolve to show up every month at the jail, which houses both immigrants held for deportation by ICE and inmates subjected to California’s mass incarceration policies (ICE rents space within from Contra Costa County). On the second Sunday of every month at 11 am, we gather for an hour outside the detention center and share activist updates, music, poetry, and storytelling from people of many faiths and identities to call for building a more just society. We invite the Kehilla community to help grow Let Our People Go—we need folks to provide snacks to visiting families, to recruit musicians and artists, to bring in wider, multi-faith/faithless networks, and so on. Come add your voice to the growing, audacious clamor for sanctuary and stand up against mass incarceration and white supremacist, authoritarian repression in our country. If not now, when? 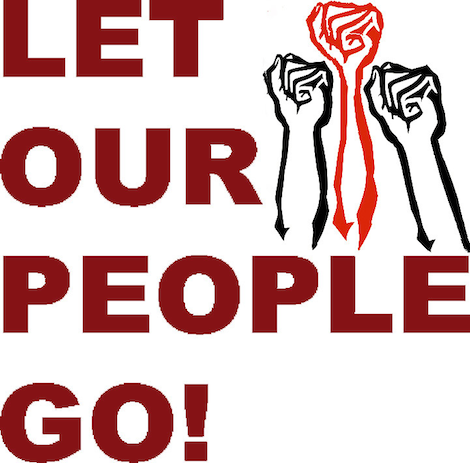 The next two Let Our People Go protests will be on Sunday, September 10 and Sunday, October 8. Beyond that, join us on second Sundays from 11 am to noon at the West County Detention Facility, 5555 Giant Highway, Richmond. Email your ideas and inquiries to letourpeoplego@kehillasynagogue.org. For other info on the work of Kehilla’s Immigration Committee, contact ImmigrationCommitteeChairs@kehillasynagogue.org.